That one Treasure Island sequel should follow so quickly on the heels of another would seem strangely coincidental. 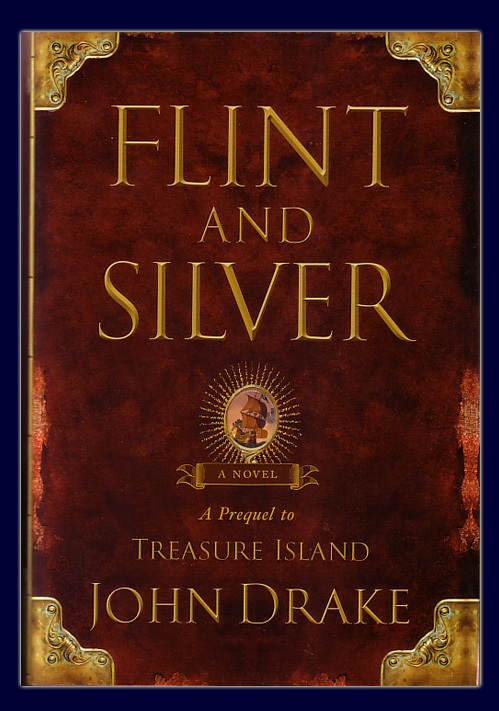 Indeed, it seems almost yesterday that I was reviewing “Silver” by Edward Chupack, and yet here I am now reviewing “Flint and Silver” by John Drake. But in truth, the similarities between these two works are few and far between. Where Silver was a re-envisioning of the characters of Treasure Island, full of sinister murder, mind-bending cyphers, and dry villainy that intentionally lacked a devout “faithfulness” to its inspiration, Flint and Silver instead attempts to perfectly mesh with the expectations set by the original work and takes a more swashbuckling, lighthearted approach to material. It follows in the “boys adventure” spirit of Treasure Island, albeit from a slightly more grown-up perspective. Not be be too blunt, but Flint and Silver is exceptional work. The characters of Long John Silver and Joseph Flint are fleshed out and expanded upon in incredible, believable detail. Long John is every bit the dubious anti-hero he was in Treasure Island, and more-so. Flint, on the other hand, being only referenced in the original novel, is an original character of a truly compelling nature – clever, heartless, bitter, yet human. To see the friendship between the two develop, flourish, and then crumble is an adventure every bit as worthy as was Treasure Island itself. And to see the development of other “minor” characters develop alongside – Mad Dog, Blind Pew, Billy Bones… only adds to the fun, and further helps establish this as a ‘genuine’ prequel of which Rober Louis Stevenson would surely approve. Beginning with Silver’s reluctant initiation into the ways of the Brethren of the Coast, the story traces his rapid rise to quartermaster (further advancement being staved off by his frustrating inability to master the arts of navigation) and eventual teaming up with Flint – Naval Lieutenant turned mutineer and eventual pirate captain. Each man finds he perfectly compliments the other in skill – Silver being a true leader of men, and Flint being a master navigator and strategist. Together they form a wildly successful pirate career until their inherent differences in motivation and humanity drive them apart. As the story unfolds, you can clearly see the foundation of Treasure Island laid out, although not to final completion as it would appear that one more novel remains before we would see the introduction of Jim Hawkins and company. I await this book with baited breath, and once you’ve read Flint and Silver, I’m confident you’ll feel the same. This entry was posted in Books and tagged bilgemunky's favorites, john drake, treasure island by Bilgemunky. Bookmark the permalink. I just happened to see this on a shelf at Borders and waited for it to become available at the library, but having read it, I am so reluctant to put it back that I am definitely going to fork over hard cash to own it, and that says something these days. 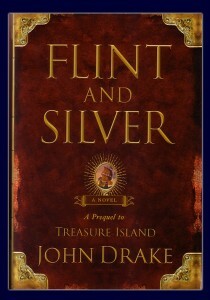 I’m usually wary of prequels, but this one does not disappoint and in fact drove me to a re-reading of “Treasure Island,” where I discovered that even such small details as Silver’s faith in banks (there is a wonderful bit of dialogue to this effect in “Flint and Silver’) and his relative youth in TI (50 might be old for a pirate, but it’s younger than he is usually portrayed) were right on the money. The mystery behind Silver’s failure to be captain, when he is so clearly the superior of everyone around him, makes perfect sense. I could have maybe done with fewer details of pirate perversity (I honestly don’t need the details every time some lowlife gets aroused, as I think we can take it as a given) and once or twice the violence got a little too CSI, but the author’s flair for dialogue and language, the many colorful details of life at sea, and (on the whole) the characterizations make for a book that stands up to repeated readings and deserves to be incorporated as part of the “real story” of Long John Silver. I look forward eagerly to the next installment. In the past three months I have read Pirate Latitudes, On Stranger Tides and Flint and Silver. Liked Flint and Silver the best, by a long shot the best. On Stranger Tides was well done and an excellent read, I’m just not much on magic and voodoo no matter how ya spell it. Keeping mine eye peeled for Pieces of Eight.